Item # 284224 Stash Points: 5,495 (?) This is the number of points you get in The Zumiez Stash for purchasing this item. Stash points are redeemable for exclusive rewards only available to Zumiez Stash members. To redeem your points check out the rewards catalog on thestash.zumiez.com. On top of earning Thrasher Magazine's cover for March 2017, Lizzie Armanto joins the pro ranks and receives her first pro model board! The deck is designed with a surrealistic abstract graphic that includes an octopus in a bowl of spaghetti, a pair of eggs on a plate, and a yellow flower. Lizzie Armanto Favorites 8.0" Skateboard Deck from Birdhouse Skateboards. 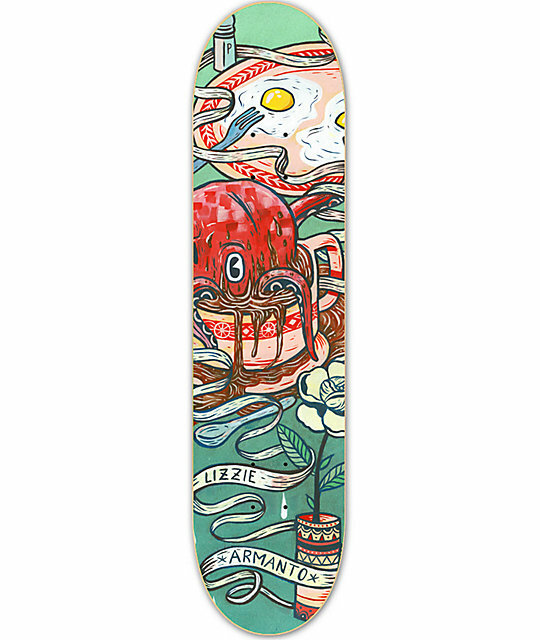 Signature Lizzie Armanto pro model deck.